By now, you're all probably tired of seeing this skirt. It has made numerous appearances on my blog but I can't help it. It really is one of my staples. I never would've thought that rust can be so versatile until I finally owned something in the shade. Going to Megamall now for some serious shopping at Primadonna and dinner at Yabu. Hope you like this post! your maxi's are the best, sarah! tried fitting it when i got home and so comfy! can't wait to wear it soon! 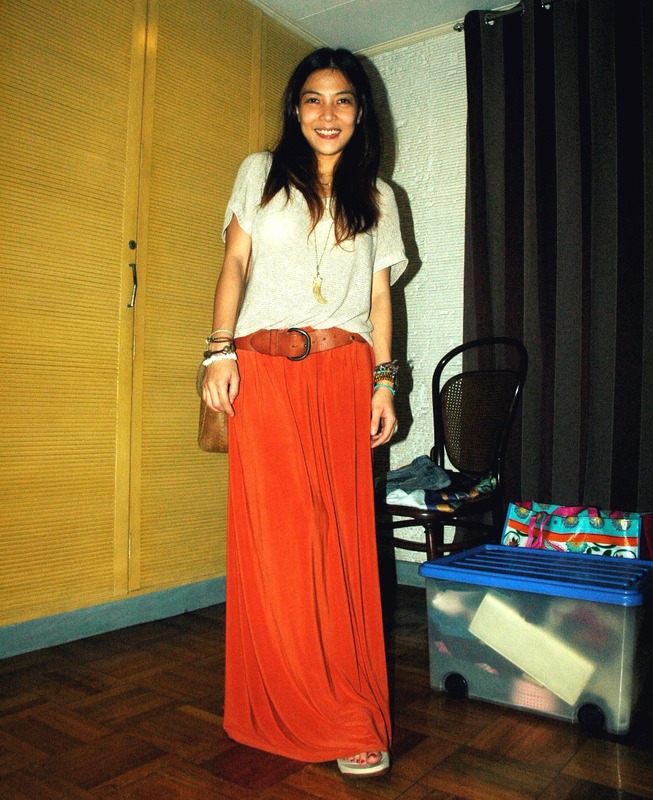 LOVING the dark orange maxi skirt! Super cute on you and totally in style for the season :) xoxo! so i won't get tired of it...maxi skirts are actually my go to fail-safe style item because i can be girly without shaving my legs...LOL. ooops! it was lovely meeting you sarah! and i was really happy to see you have bigger photos now...hehe. naalala ko yung tutorials naming sayo..hehehe.